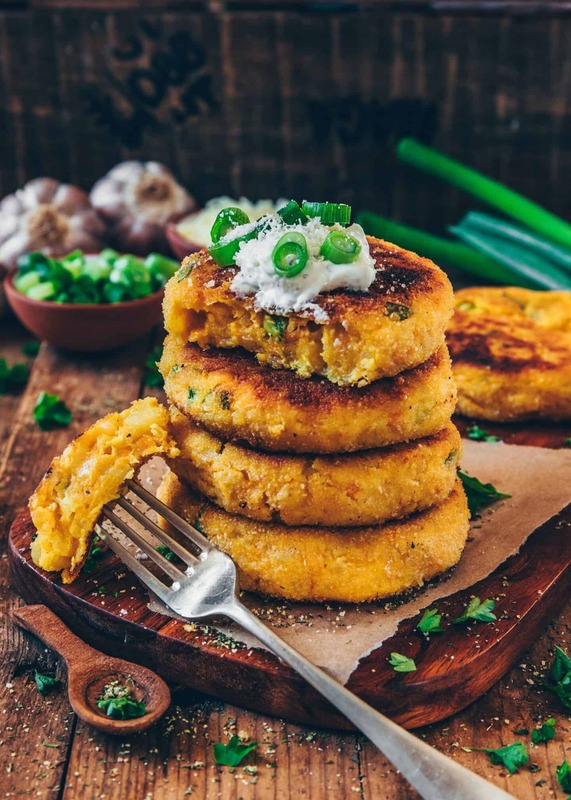 These cheesy vegan potato cakes are quick and very easy to make! It makes a simple and tasty side dish, dinner or lunch, and it’s the best way to use up leftover potatoes! 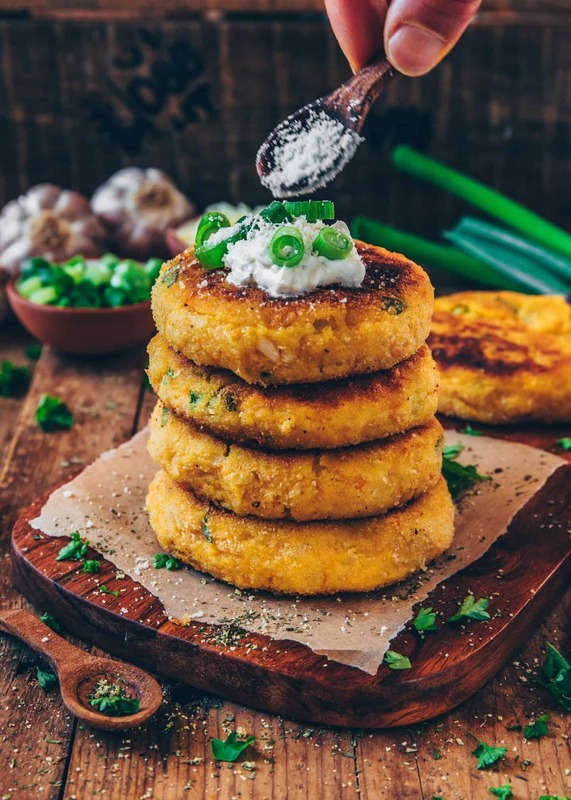 What would you say about some delicious potato cakes, that are crispy on the outside and creamy on the inside? I think, it couldn’t get any better, especially when it’s loaded with cheese! 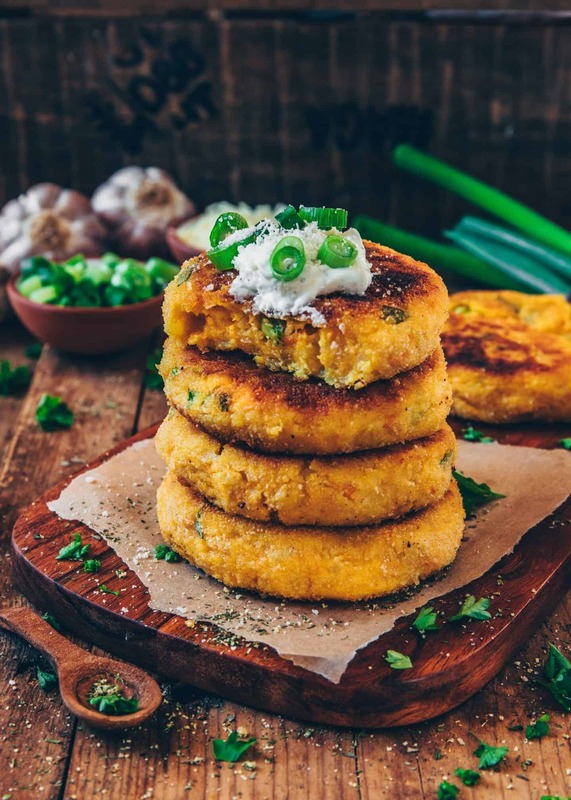 These potato cakes are sort of like veggie and potato fritters, but they’re made from mashed potatoes and also contain a little vegan cheese, carrots, fresh herbs and spices. That’s it! Super simple, healthy and SO GOOD! 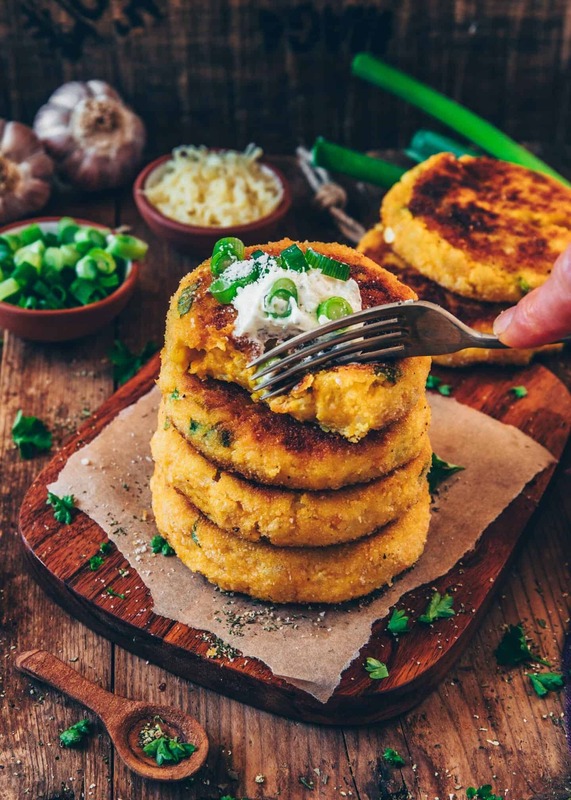 Easy cheesy potato cakes make leftover potatoes into a delicious meal! If you’re anything like me, I always seem to prepare some extra food for the next days, so I usually end up with leftovers. 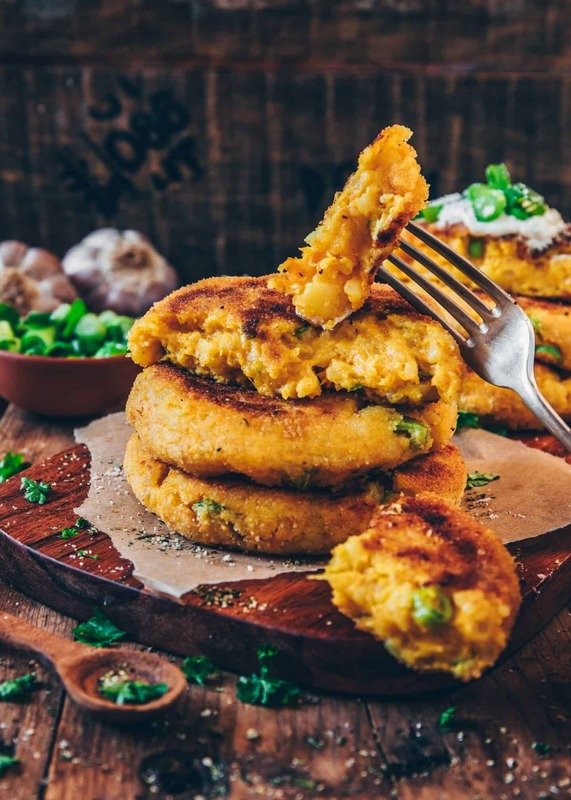 Either I freeze them or use them for other recipes, like these mashed potato cakes. 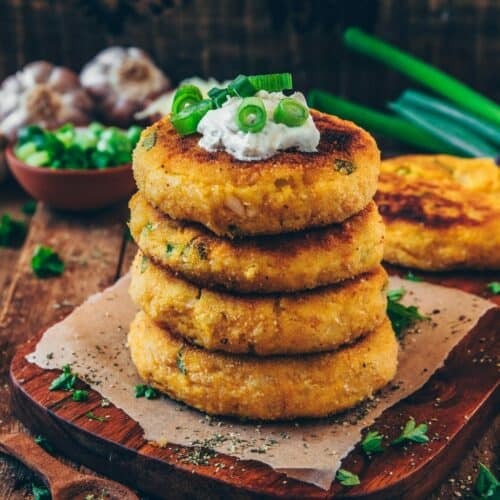 Anyways, they’re so delicious that you‘ll definitely boil up some potatoes to make these yummy potato cakes, if you don’t already have any leftover potatoes. 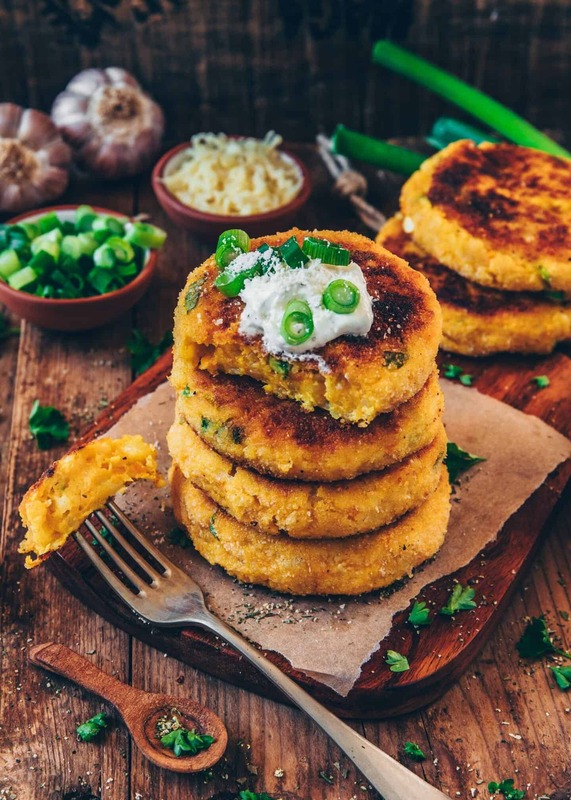 I‘m sure this recipe will become your new favorite, because everyone will love these tasty cheesy potato cakes, even your kids! 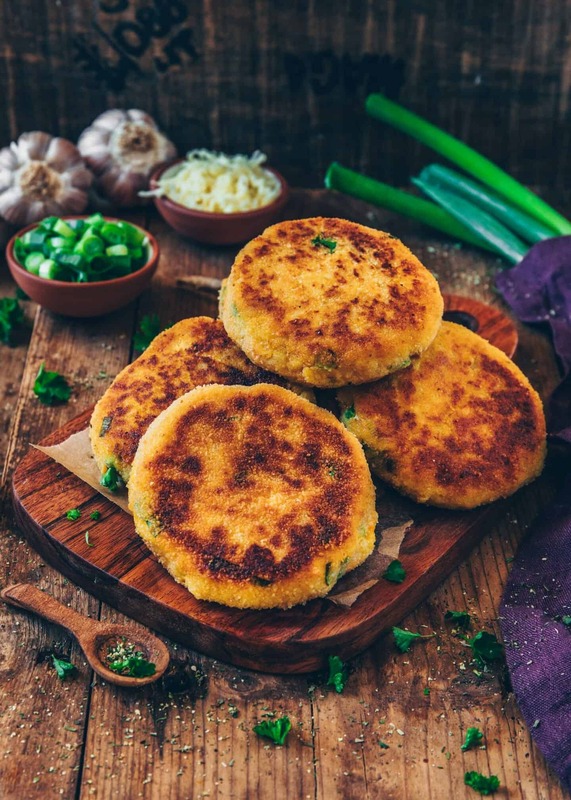 These crispy creamy and cheesy potato cakes can be made super fast. Actually, if you have any cooked potatoes left, they’re ready in only 15 minutes. You could also use leftover mashed potatoes, but please make sure that you didn’t add too much milk and butter. Otherwise you‘ll probably end up in adding too much flour. Then the potato cakes will get bland and floury. Simply mash your potatoes, add a little vegan cheese, chopped herbs, a pinch of salt, ground pepper and nutmeg. Mix all the ingredients together, then form to cakes in your desired size. Coat each cake in some flour or bread crumbs and fry in vegetable oil until golden brown and crispy on both sides. 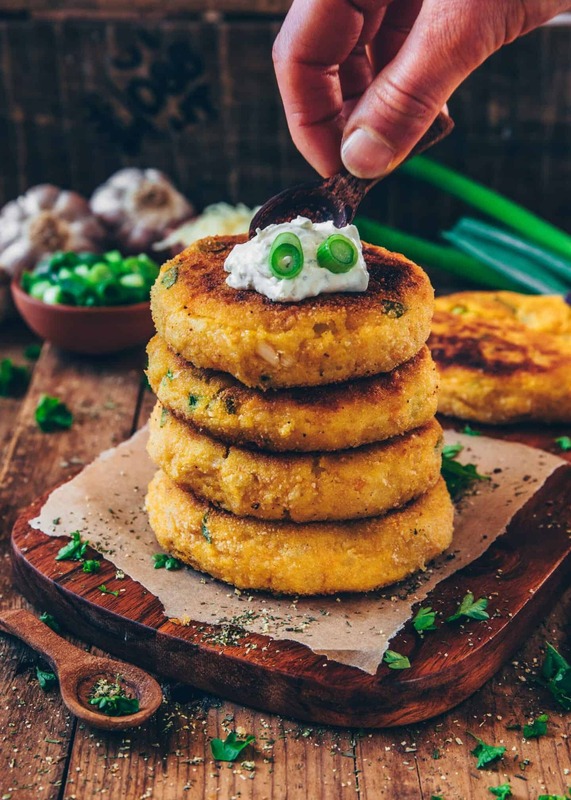 These Leftover Mashed Potato Cakes are crispy on the outside, tender on the inside and full of flavor! You can really get creative with the seasonings and add ins in this easy recipe! Pretty much anything in your fridge will do. If you’re in the mood to modify this recipe, you could also stuff them with mushrooms or with spinach cream or with a creamy pumpkin filling. Anyways, they make a perfect light and hearty meal, and they’re a great way to use up any leftover Thanksgiving mashed potatoes. What I love about this recipe, is that it requires pan frying rather than deep frying and that’s much healthier. 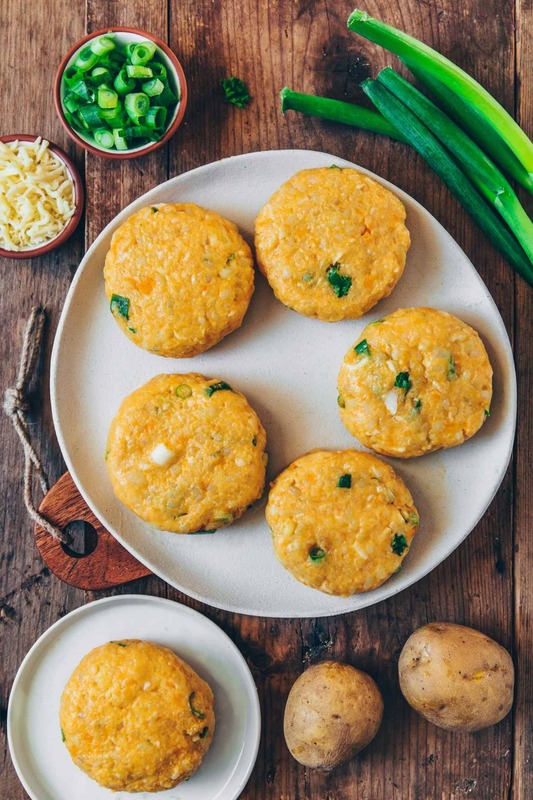 I would recommend serving these potato cakes immediately while they’re still hot, but I also like them when they’re cold. 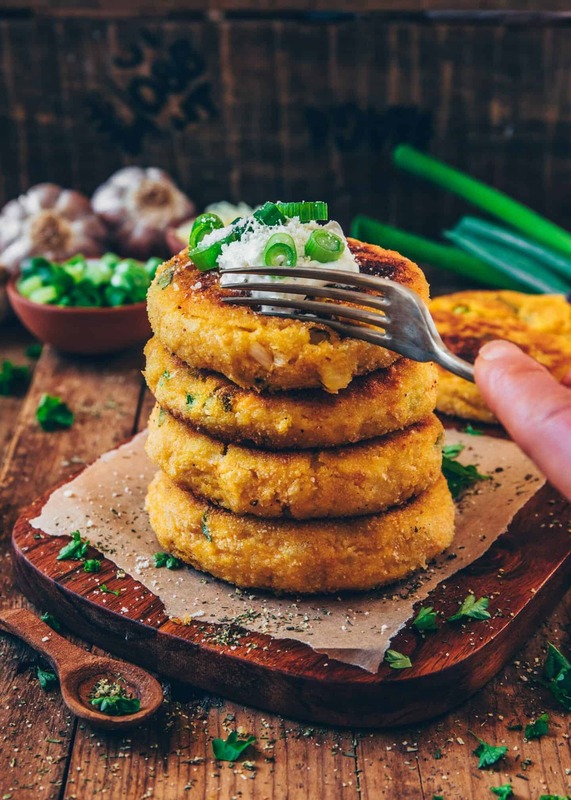 If you have any mashed potato cakes left, you could also reheat them in the oven. Just bake for 10-12 minutes at 350°F until warm and crispy. They’ll get a little more crispy rather than just pan-fried, but maybe you’ll like them even more that way. Cook potatoes in skin along with the carrot until tender, then drain and peel potatoes. Mash using a potato masher and let cool completely. (Optionally, use leftover mashed potatoes). In a large mixing bowl, stir together mashed potatoes, herbs and seasonings. Add flour and vegan cheese and stir until all flour is incorporated. Form 6-8 balls of dough (or make smaller cakes if you prefer). 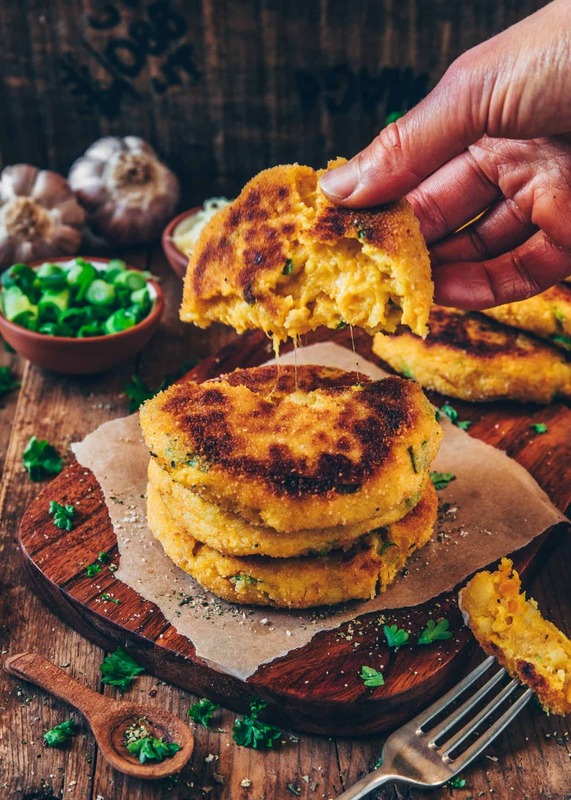 Roll each one in additional flour (or bread crumbs), then gently flattening into patties. In a large skillet, heat up 2 tablespoons of plantbased oil on medium heat. 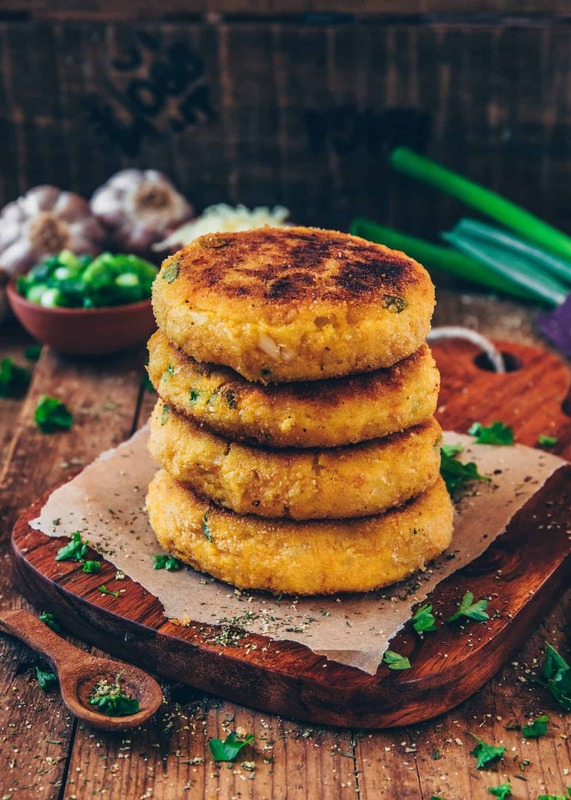 Fry each potato cake on one side for about 3-5 minutes, until golden brown. Then flip and fry on the other side. 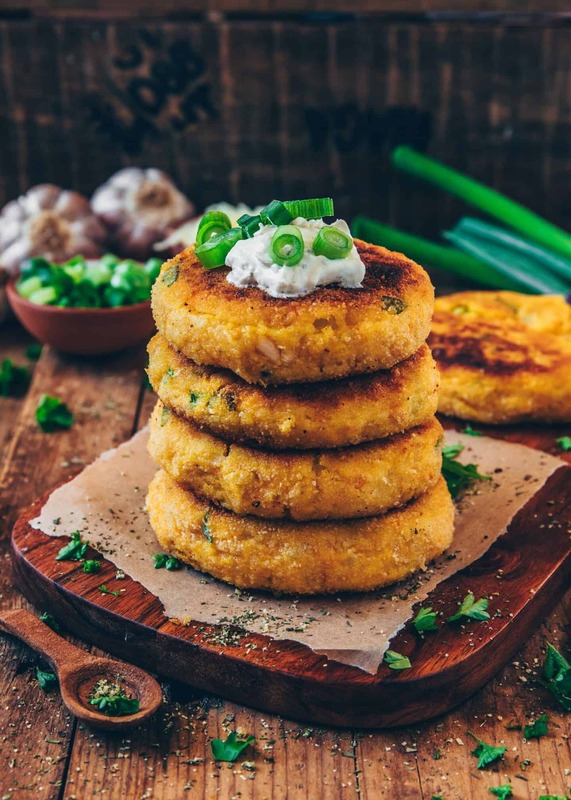 Serve with cashew dip or vegan cream cheese and some more fresh herbs. 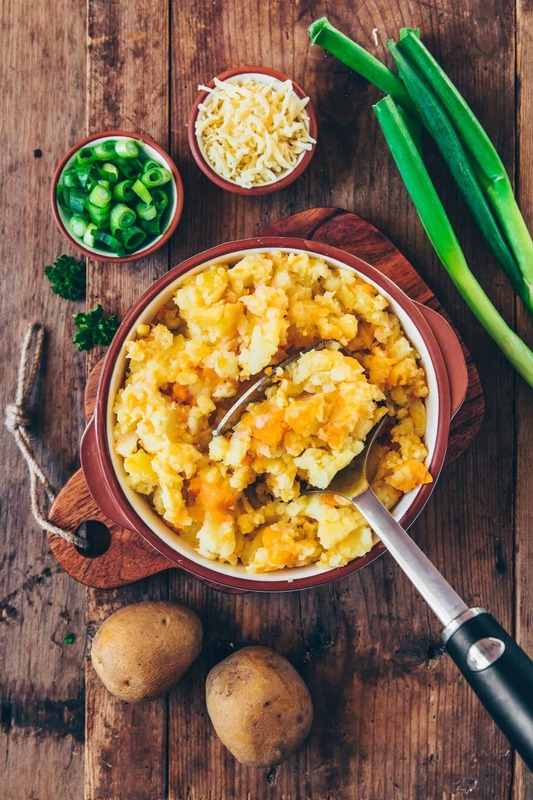 This recipe works best with cooked potatoes, but you could also use leftover mashed potatoes. If they are very moist, you may need more flour to hold in shape. Please do not use instant mashed potatoes. To make this recipe gluten-free you could use a gluten-free flour blend. Leftovers can be reheat in the oven. Simply bake for approx. 10-12 minutes at 350°F until warm and crispy. Yes, I really love them too! So glad that you like Potatoes too! Hope you’ll like this recipe if you try it. Thank you for the recipe, Bianca! I made these last night and fried them in vegan butter — and like you described, they were perfectly crispy outside and creamy inside! So glad that you and also your mom liked this recipe! So tastefull and yummie! Really one of my favorites. Next time I will skip the cheese because I don’t think they need it for the taste. Of course, you can skip the cheese. It’s just an option. Hello! This looks amazing, I’m going to try to do them this week, you think it would work with sweet potato as well ? Sure you can do it with sweet potato but I recommend to combine regular potatoes and sweet potatoes because the texture will be softer when using only sweet potato. Otherwise, you could also add more flour or cornstarch. I’m doing oil free so can I bake them in the oven instead? You could try it but I recommend to brush them with a little oil, or they will be too try and not delicious.